At the moment I’m 100% focused on the conversion of my Summer House into my studio and possible part time Airbnb space. The refurbished summer house will be self sufficient with it’s own bathroom, kitchen and bedroom space (if I choose to put a bed in there), if not, then office/ workshop space. It’s all feeling rather rushed as at the last minute the builder said he can fit me in – and I have nothing planned. So I have to act quick, and firstly I’m focusing on my bathroom. So in the bathroom will be a walk in shower, eco toilet – I’ll come to that in another post and a small basin. I’ve decided my colour palette will be monochromatic – simple black and white. I was going to add brass taps to the mix, but I’m struggling to find anything on a short lead time that I like. Will I settle for chrome? Or maybe I can find something in matt black? Do you know of any drop dead gorgeous brass taps I can get here in the UK on a short lead time? Anyway, to help you visualise, here’s my floor plan for the summerhouse, and in particular the bathroom. You can see that the bathroom is tiny. I’m not going to try any magical tricks to make it feel big like paint the walls light so that light bounces all around. At the moment, there’s no natural light in there to bounce around (but I might add in a window so that it doesn’t feel too claustrophobic and to help remove any nasty odours if you know what I mean!). Colour-wise though, I’m going to go moody in there on the walls although I’ll be keeping the wall tiles around the shower light and bright. The basin is 400mm wide (not that I’ve ordered it yet – but it will be). So the bathroom mirror has to be the same width (ish). I’ve decided that I’m going for either a black or brass framed bathroom mirror and my budget on this is hugely important as I don’t have any spare funds. I’m literally selling possessions on eBay to fund this. So here is my top 5 choice of bathroom mirrors. Please let me know which one you like best? Graham and Green £395 – too expensive for me – but I like this style, where can I get something for a fraction of the price? Personally, I think my favourite is the Made.com one. What do you think? In my next post I’ll show you my whole mood board for the bathroom. Please subscribe if you don’t want to miss out on the transformation. At the moment on Instagram it’s going around that everyone gives 20 facts about themselves. Some of them are really amusing and others are very eye opening. 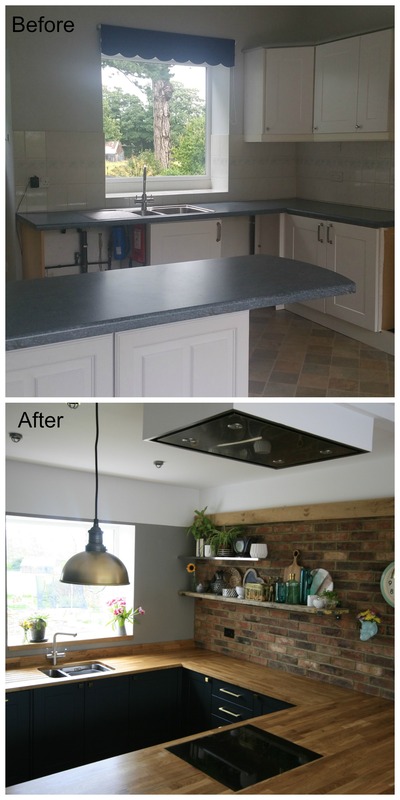 I thought about 20 facts about me, but just as I was nodding off I had a thought – let’s do 20 facts about my kitchen renovation, which is a little bit bespoke with my Howdens kitchen hack. Here goes. The kitchen units are from Howdens and it’s the Burford White range. My builder spray painted all the doors Farrow and Ball Railings. This process was not as easy as I’m making out though. I’m not sure how the Howdens doors are finished, but they are not designed to be painted over. They are like a laminate and any paint you put on, easily comes off. If it wasn’t for a blog post by Swoonworthy then I might have given up on my dream of painted kitchen units. I love my brick wall, but it’s actually brick tiles stuck to the wall – so it’s a little bit faux, as is the beam above. And, in case you were wondering, the brick tiles were from eBay – they are excellent quality – read this post to find out where they are from. 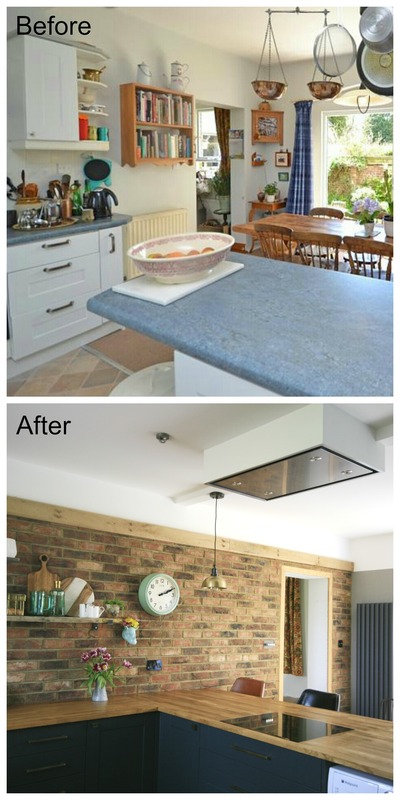 We decided to install a beam in there as the rest of the house, which is a converted stable and coach house is full of them, so I had to bring one into the kitchen – plus it reduced the cost of the brick wall so it was a great idea. 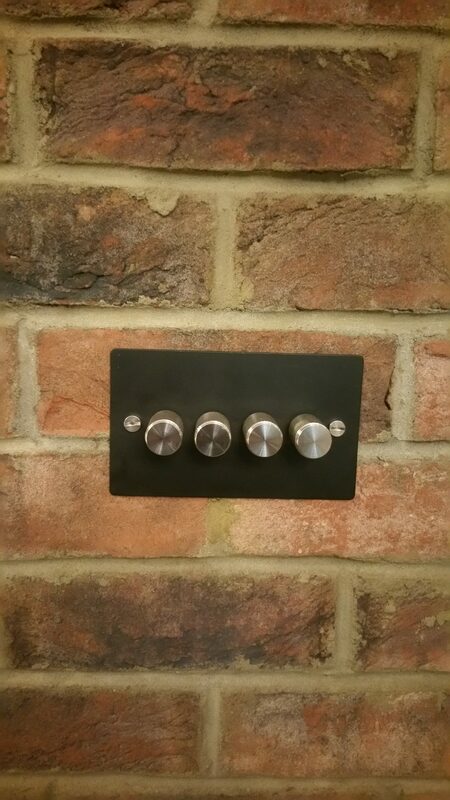 The source of inspiration for my kitchen came from a number of places, the brick wall – from my project management days when I installed them all over London homes of the rich and very rich. The painted units from Pink house living – I just love her kitchen transformation. Plus I decided to use shelves and not wall cupboards after seeing lisa dawson styling and what she did with her kitchen – so essentially most my inspiration was from Interior bloggers from Instagram. More reason to stay obsessed with it for a little longer. The real wood flooring is from a local woodyard – it’s lovely and warm underfoot. I have oil fired central heating and I think underfloor heating would have been an expensive affair – hence I went with a warm material. The kitchen design has more storage than I know what to put in there. I won’t be struggling for long though. 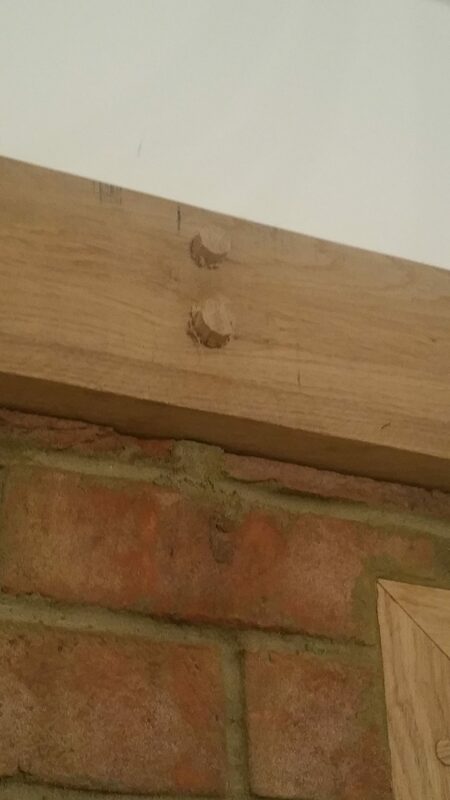 Those shelves are merely scaffolding planks which have been slightly sanded. They cost £1 per foot – so £15 for the two. 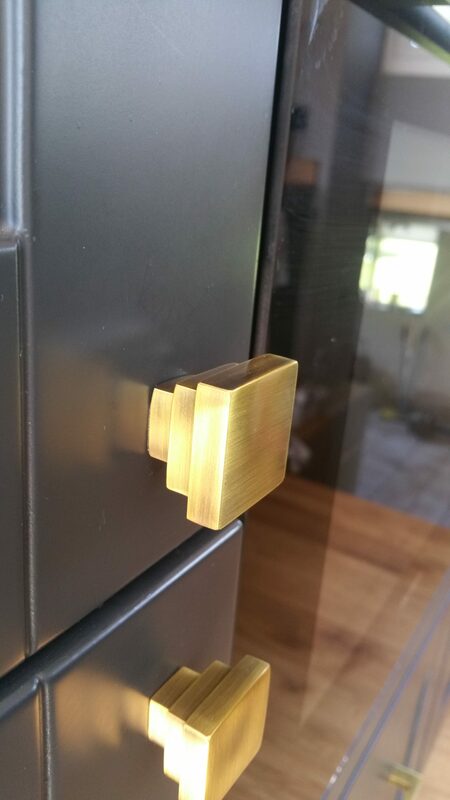 The chunky brass handles are from Stronghold Direct – following a top tip from French For Pineapple, who coincidently provided me with lots of advice and help throughout my renovation – thank you Bianca. These gorgeous light switches are from Buster and Punch. The large pendant light was from BHS (not on these pictures – as it’s above my table area, still to be finished) (purchased back in Octoberish time) when it sadly closed down. It was an absolute bargain, but that’s no consolation to the poor staff that lost their jobs. 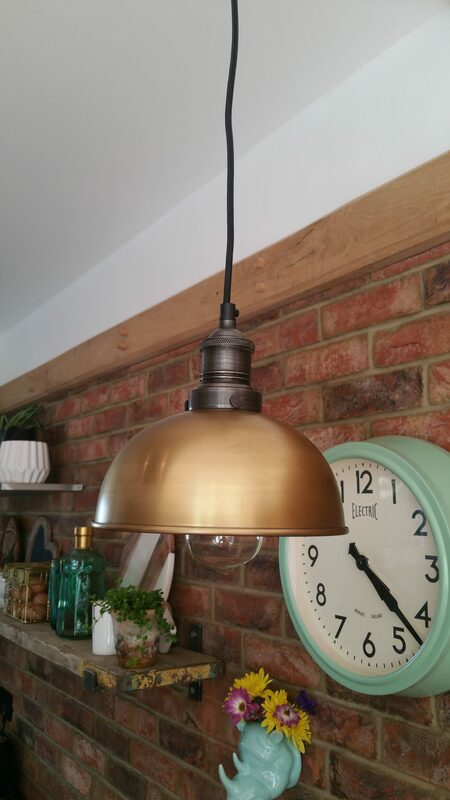 Our small brass pendant lights are from industville. I have a 2 metre void under the kitchen floor and a nice hatch to access that void. I will be storing my best stash of wine under there, but for now it’s in my wine fridge. One side for red and the other for white! If asked, I would say that my favourite appliance is my instant hot water tap. No more kettles for me. All my new appliances are from Siemens – and they have such snazzy features that I’m still learning how to use them – what I do know is that they bleep a lot at me! I’m a little disappointed that the kitchen is not quite finished (aarghh! ), the panel by the feet at the breakfast bar has still to be painted but I’m undecided what to do there and there are some little touch ups still to do. I saved a lot of money by sending back all my décor end panels to Howdens and spray painting mdf instead. The most useful storage is a bin stored in a cupboard which takes all the rubbish away and no need for an unsightly bin in the kitchen – but I do have an unsightly compost bin/ large Tupperware box on top of the worktop, which I of course hide whenever taking photos. Crikey I’m struggling now – I might have to fill in with facts about myself at this rate. There is far too much wooden worktop for my liking. I would have liked quartz or stone but we ran out of budget so wood it was. At least wood has a nice warm quality, but I’m the worktop police as I’m convinced there are going to be coffee cup rings before too long. The renovation maybe over but there’s still lots to do in the kitchen. I need artwork, texture in there, but that’ll have to wait. 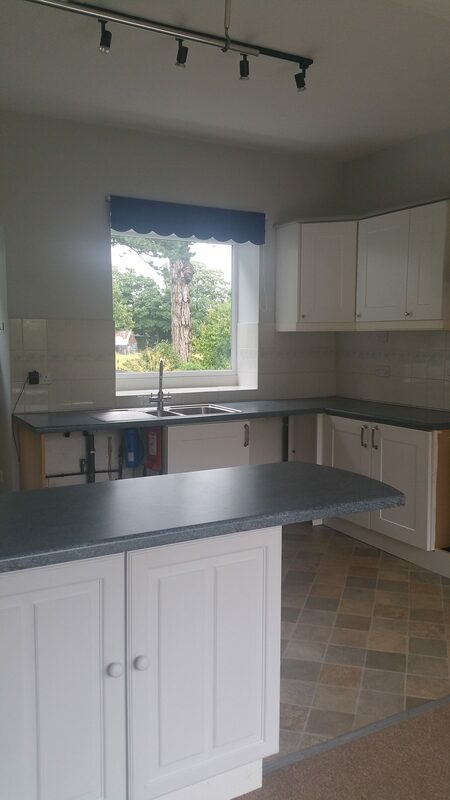 For now, I’m happy with my new kitchen – and yes it is MINE at the moment but maybe I’ll start sharing it soon. If I’ve missed anything, then please feel free to ask. Here’s some photos of the transformation. What’s wrong with faking it? Thanks for looking, and if you are as Interiors Obsessed as me, let me know if there's anything you would like me to cover in my blog.